We are simultaneously feeding ourselves and the amazing growing child in our tummy. It is important to nourish the both of us with the nutrients we need for optimal development. While doing this, we must also satisfy our own (sometimes raging) appetite, and avoid disease such as preeclampsia and gestational diabetes. While pregnancy is not the time to be dieting (we want to gain 25-35 pounds), research shows that women who eat a high fat diet are more likely to have babies that have higher fat mass and smaller livers. Therefore, sticking to a healthful diet, while consuming an extra 300 calories per day, is a good goal. Of course, we don’t want our additional 300 calories to come from corn chips or cheesy fries, but instead from nutrient rich foods like fruit, vegetables, whole grains, and lean protein. Avoiding empty calories from processed foods as much as possible is ideal. So if we’re not actually dieting, what exactly is the pregnancy diet? Below you will find some broad guidelines to help you get on the right track along with pregnancy superfoods and tips on going organic. Some of these nutrients you may not be able to meet through diet alone, and supplementation is strongly recommended. These are the key nutrients we will build our diet around. Folic acid prevents neural tube defects and plays a role in the production of red blood cells. Good sources of folic acid include fortified cereals, leafy green vegetables, asparagus, broccoli, chick peas, and citrus fruits. Amino acids, the building blocks of protein, are largely the make up of your body’s cells and the cells of your baby. Getting enough protein during pregnancy, especially during the second and third trimesters, is important because your baby is growing fast, along with your body which is growing to accommodate your baby! Foods with high levels of protein include beans, lean meats, poultry, fish, eggs, milk, cheese, and yogurt. Your baby needs adequate calcium for bone and teeth development. If they do not get enough calcium they can actually take from your bones, leading you to developing osteoporosis later in life. Dairy is the primary source of calcium. Other high calcium foods include leafy greens, seafood, and legumes. Vitamin D deficiency during pregnancy can lead to the same deficiency in your baby, putting the baby at risk for rickets, abnormal bone growth, and delayed physical development. This can pose long-lasting effects on bone development and immune function into adulthood. 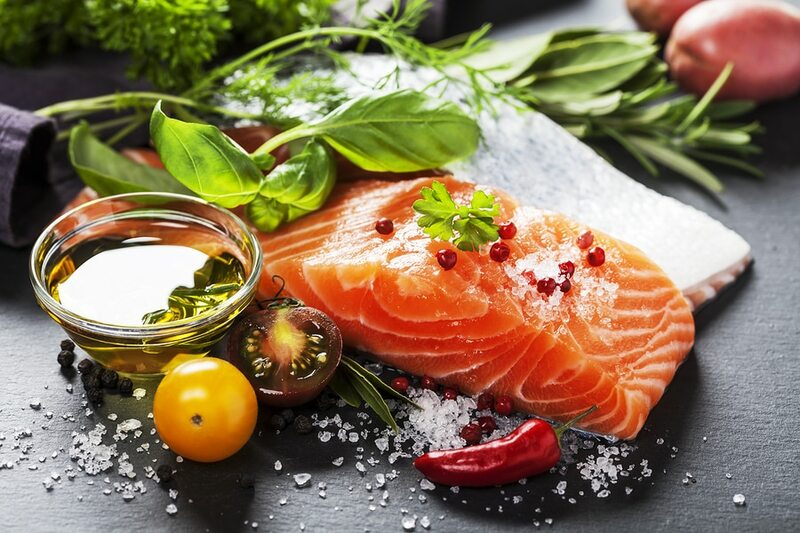 Salmon, fortified milk, cheese, eggs, and mushrooms are all sources of vitamin D.
Iron is essential for making hemoglobin, a protein in the blood that carries oxygen. Because blood volume increases by 50% while pregnant, we must increase our iron intake in order to increase our hemoglobin levels. Iron deficient anemia can lead to preterm labor, low birth weight, and infant mortality. There are two sources of iron, one from plant protein and one from animal protein. It is important to try and get both sources. The best source of iron is red meat. Chicken and turkey are also great sources. Vegetable based iron sources include chick peas, edamame, and whole wheat bread. Fish is a great source of protein, iron and zinc — crucial nutrients for your baby’s growth and development. It is also rich in omega-3 fatty acid, DHA, helping to promote your baby’s brain development. Salmon is also one of the rare food sources that provides vitamin D.
Greek yogurt is rich in calcium, provides 15-20 grams of protein per serving, and many have probiotics that might help to battle bloating or other pregnancy induced GI woes. Spinach, kale, and chard, are all high in fiber to keep that digestion moving. They are also a non-dairy source of calcium, and a great source of folic acid, iron, and vitamin C. Dark leafy greens are essentially free of fat and calories. Add them to everything from omelettes, to shakes, to soups to boost the nutrient and fiber content of your favorite meals. Pronounced keen-wah, quinoa is a nutrient rich superfood, providing an excellent source for plant based complete protein- especially important for vegetarian and vegan expecting mothers. Just one cup of quinoa boasts 24 grams of satiating, cell-building protein. Quinoa is also high in fiber, folate, and zinc. This superfood is a nutrient powerhouse! Chickpeas, lentils, black beans, and soybeans supply fiber, protein, iron, folate, calcium, and zinc! Beans are essential for mothers suffering from common meat aversions in order to help them to continue to meet their protein needs. Should I go organic during pregnancy? Studies have concluded that children who have had high exposure to high levels of pesticides in the womb have lower IQ scores than their peers once they reach school age. Not everyone can afford to go completely organic, but doing so for foods that we know have the highest levels of pesticides makes a big difference. Foods to strongly consider buying organic include: apples, strawberries, grapes, celery, peaches, spinach, sweet bell peppers, imported nectarines, cucumbers, cherry tomatoes, imported snap peas, and potatoes. Eating a variety of foods during pregnancy is extremely important to ensure you are meeting all of your nutrient needs. Avoiding empty calories from junk foods, fats and sweets, will also insure you are getting your calories from healthful sources.